Which Makes More Money? Which gets better CPC (cost per click)? Need to know whether AdSense or Amazon Affiliates (Associates) earns more? I’ve been running AdSense along with Amazon Affiliate Program on one of my Flippa-bought sites for the past 9 months. Now I have some solid earnings stats along with Cost Per Click data to analyze and see which one makes more money. AdSense had much better placements in “prime locations” of the website, whereas Amazon ads were placed in the middle and in the end of content, and NOT on all pages (but on the most visited ones). Therefore, the likelihood of an AdSense ad being clicked was much higher than the Amazon ad. Also you need to keep in mind – Amazon pays commissions only for bought AND shipped items that came from clicks on your website. AdSense pays for (almost) every click, regardless of whether a user bought anything in the end. Update Feb 28, 2017: New fixed rate commissions system goes into effect on Mar-1-2017. No more volume based tiers. Check out the details and new amazon affiliate rates. All info in this post about commission rates based on volume no longer apply. UPDATE: Dec 9,2016 After buying an Amazon affiliate site that “sells” more expensive items, I figured out the “best” tactic. Amazon commissions rate are calculated based on number of units. My rate is always 7%. This means that I refer 111-320 item sales each months. If you refer more expensive items ($100+) but you move say 1-6 units, commission will be 4%. Just add few cheap items to the mix and you will see a 50% jump in commissions! So if that’s the case, but you supplement your expensive items with loads of cheap items, your rate will go up. For example, lets say you refer furniture that costs $700 / each, and you refer 6 items. Your commission will be $168. Just add say 5 $10 items, and your rate goes to 6%. Now you will earn $252 for your $700 products and $3 for $10 products ($255 total). But your overall earnings go up by $87 which is a 52% increase! If you can’t add enough items on your own, just go to Flippa and buy a cheap (but quality) Amazon affiliate site, that moves a lot of inexpensive items, and bump up your rate! The earnings below were between Oct 4, 2015 and July 5, 2016. As you can see, AdSense made 3 times more money than Amazon. However, this is not the whole picture. Note: In the image above, if you look at RPM (revenue per 1000 page-views) curve – the purple line – you will see a very slight downward trend. I associate this with larger Amazon ads exposure and the addition of 3rd party affiliate ads in March 2016. Other fluctuations are likely due to change in Cost Per Click and/or Click-Through-Rate during SLOW winter months. Now let’s look at details. During this period AdSense had roughly 5500 ad clicks. I can’t disclose the exact number, because that would violate AdSense rules. However the number is pretty close to the actual clicks, so we can get some very accurate Cost-per-Click numbers from it. Again AdSense CPC is 3.24 times higher than Amazon CPC, so AdSense is a clear winner in terms of dollars per visitor AND per click. But let’s consider additional factors that affect how much more AdSense would have earned if Amazon ads were not there. We are still limited by 3 ads per page, so if I wanted to replace Amazon ads, I would have lower total ad count. I’m not 100% sure when I placed Amazon ads on the site, but it was definitely in Oct-Nov of 2015. In early 2016, I added other Affiliate ads to the mix, and it is unknown what effect they had on total income for AdSense. 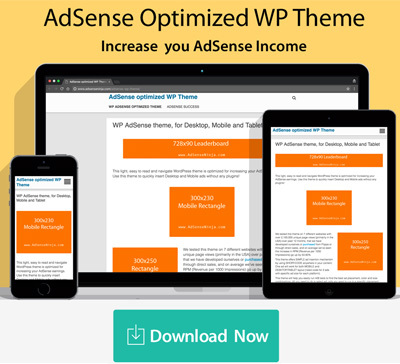 I’ve changed site layouts to my custom AdSense optimized WP theme in early 2016 (and added a 3rd ad type at the same time), and while it did not have major effect on AdSense RPM, it might have affected total income per visitor. A) Create A/B test on site theme level. 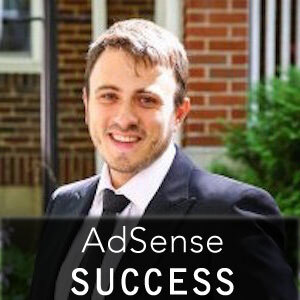 One variation will show ONLY AdSense ads in the Most Prominent locations. The second variation will be the current layout and ad types (AdSense, Amazon, 3rd party affiliate program). This is also known as the control version. B) I’m also going to count total income by MONTH, and divide by total number of unique site visitors since Oct, going forward. Option B will give me a good picture of how much I was earning per visitor historically and currently. I can then compare this figure to AdSense ONLY earning per visitor from AB Test in option A, to see which earns more money. I will report on my findings in a few months (it’s best to let AB Tests run as long as possible), unless I find that either version VASTLY outperforms the other within a short period of time – say 2 weeks. 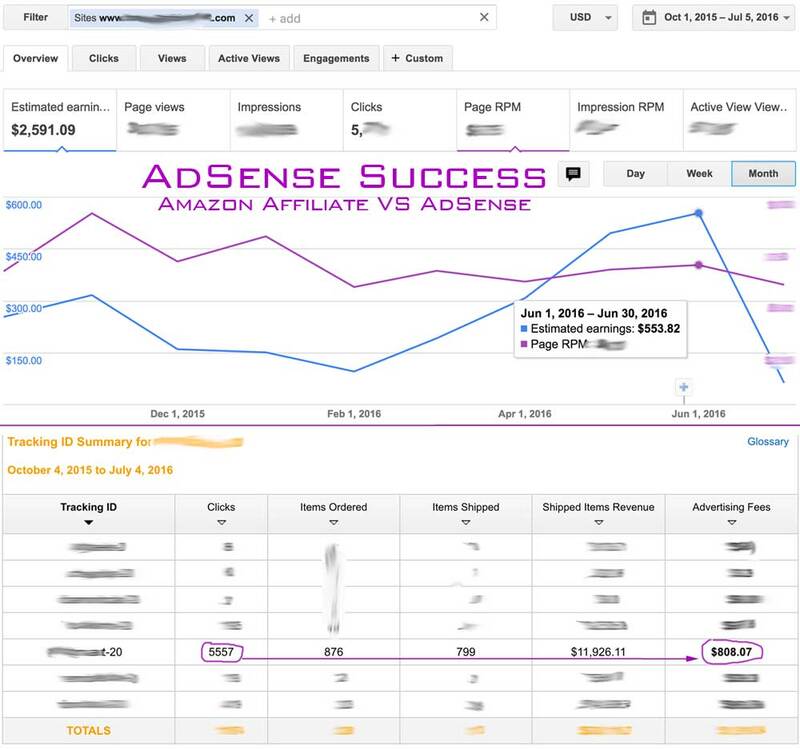 Conclusions so far – AdSense makes 3 times more money, but Amazon ads get more clicks! So this is actually very important, and it means that you SHOULD NOT discount Amazon Associate from your ad mix! The Amazon ads are for relatively low price items sold on Amazon. The most expensive “commonly bought” item costs $15. Therefore, if items would cost $30, the average commissions would double. For example, I have another site that seldom leads to a purchase of a $600 couch on Amazon. My commission for each of those sales is about $56. Point is – if your site could lead people to buy $50 items in high enough quantities, you would be making a much higher CPC and a lot more money with Amazon! This is also reflected in the number of CLICKS to both programs – they are nearly identical, while AdSense has a much better exposure. So if there you combine higher priced items with more clicks, you have the winner! At the same time, while $0.47 CPC is pretty high, I know many sites that earn about double that, or more! So if AdSense CPC was higher, then Amazon would be a clear loser. What you should take from this? It all depends on the type of site you have. If your site has a lot of traffic about a popular product on Amazon that sells for $30+ then maybe Amazon would be a much better match for you. The only issue I see with Amazon ads – they look very weird at the top of the page. Since this is one of my Flippa-bought “pet projects” I can report good news. I bought this site in early Oct. 2015 for $3300. As you can see from total combined AdSense + Amazon earnings, in roughly 9 months, I’ve made $3400 which is already more than what I paid for it. However, earnings from the 3rd income source are now between $448 (since April), so it’s safe to say that the site has earned 116.4% in 9 month! By October 2016, I expect it to make over $5000 total, and probably more, given that In April, the site has made $700, and in May/June it made slightly over $900 each month. If this trend continues in July, August and part of September, the total earnings will be over $6000 for 12 months since purchase! Lastly, if you want to learn more about the techniques I use to optimize Ad Placement and to run AB Tests – I will be teaching them in my upcoming AdSense course, so stay tuned for updates! Good analysis yeah i think I will be switching over to adsense from Amazon myself thanks for the comparison very helpful stuff. Can Amazon pays for just viewing of ads please reply me. I think Amazon does have CPA ads, but they pay VERY little … you are much better off with AdSense / Taboola, etc. Nice post so we should decide Adsense first. I have visited other site about it and found same result thanks. I always thought Amazon Affiliate is super duper best than Adsense but when I search on google and read your post, my mind has been changed. Kudos. I think AdSense is far better than Amazon Ads. Thanks for your details comparison. Amazon can be very profitable, if you are referring high ticket items, costing $100 or more, and have good conversions. If you “sell” ten $300 items with 5% commission rate a day, you’d be making $150 a day. To make that on AdSense, you’d typically need over 150 clicks on adsense to accomplish the same, with $1 CPC … many sites have much lower CPC, and with average 1% click-through rate, to get 150 clicks you’d need 15000 visitors per day to match AdSense to Amazon. Reality is, that a well optimized amazon associates site will make more than AdSense. However for me, I don’t have time or energy to optimize for amazon, or create affiliate sites. I simply buy an AdSense site, optimize ad placement, and collect … minimal effort, for maximum returns! Thanks for the info, I recently bought a flippa Amazon product website but even though I got the website file I am clueless how to go about running it. I need to know how to steps in getting it monetized, how to check for orders and payments as well as entering my PayPal and do forth. Hmm … well that’s a lot to handle at once, if you’ve never done this before. Basic steps would be – upload zip file to roof of your website, unzip content. Create a new mySQL database, import db file that you got from seller. Then find the file that connects your site to the DB, and change DB server, DB name, DB user, and DB pass to your newly created DB. Usually server will be “localhost” … Since you say the site is based on WordPress, you will need to edit wp-config.php file with new db settings. Then all you need to do is sign up for Amazon Associates, create tracking channels, and change/update product links with your tracking code. There are a million ways this is implemented, so you will need to figure this one out yourself. I hope you figure all this out – there is plenty of information out there on how to do it. I’d start on YouTube. That said, I highly recommend that noobs (please don’t take offense) should not buy sites, without learning how it works first. Know how to transfer domains, change DNS, etc. Know how to install WP manually (not with one-click installation). Have some basic knowledge of HTML/PHP. Ideally you should have done the following, before buying a site: Register any domain name on one registrar, and transfer it to another registrar. Backup existing site on one hosting account, and transfer/restore on another hosting. Purpose of this exercise is to get comfortable with website / domain transfers, before investing huge sums of money into buying. Buying websites is very tricky and risky, if you have no webmaster experience at all, but it can all be learned in one week, and for less than $100. It’s much more expensive to do what you did – buy a site and be stuck with zip file and domain name, and now knowing what to do. I really hope you figured all of the above fast, and got your site up and running. Finally, I advise people to be EXTREMELY careful buying amazon sites.